The Nazis came late to Hungary because, until early 1944, Germany and Hungary were allies. But when they did arrive, their orders were to put the "Final Solution" into effect with deliberate speed. 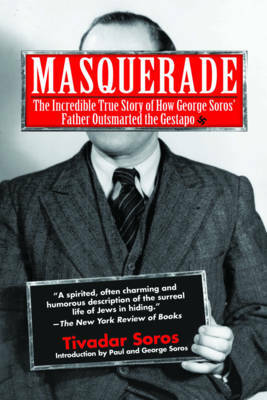 Soros, a Jewish lawyer in Budapest, secured fake Christian identities for himself, his wife, and his two sons following the German invasion of Hungary on March 19, 1944. In a narrative reminiscent of the great Primo Levi, Soros recounts his experiences with a beguiling humor, deep humanity, and a wisdom that is humbling. Superbly translated by Humphrey Tonkin, Masquerade is a unique account of how one man managed not only to survive but to retain his integrity, compassion, family unity, and humor by "dancing around death." Like Klemperer's Diary of the Nazi Years, this very personal, low-key testament of the Holocaust is a gripping depiction of "normal" daily life under the Nazis--told by a man who triumphed by leading an ordinary life under extraordinary and terrifying circumstances.